Hull Royal Infirmary’s main entrance has been re-opened to staff and visitors this morning after a glass panel cracked on the tower block. One of the 7,000 glass panels on the 13-storey tower block was damaged by high winds on Sunday. Although no-one was injured, Hull University Teaching Hospitals NHS Trust took the precaution of cordoning off the main entrance and cash machine, directing staff and visitors to the back entrance until safety checks were carried out. Now, after members of the trust’s estates team oversaw a safety inspection of the affected panel, the main entrance has been re-opened, with people able to use the cash machine once more. Duncan Taylor, the trust’s Director of Estates, Facilities and Development, said: “One of the panels on the fourth floor cracked like a car windscreen in the strong winds and broke into pieces about one centimetre in size. “We’re investigating what caused the panel to crack. 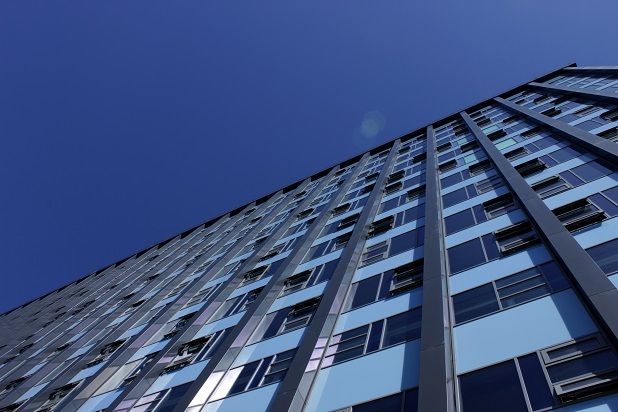 However, just four of the 7,000 glass panels in place in the tower block have cracked since they were installed four years ago.